I’m Hannah. I’m a writer, reader, and managing editor who loves all of the above plus dogs, Earl Grey tea, dark chocolate, museums, summer, and ghost stories. Seriously, I visit A LOT of museums and I’m that person who has to read everything and touch everything before I leave an exhibit. Except for the security guards. They don’t really look kindly on that. 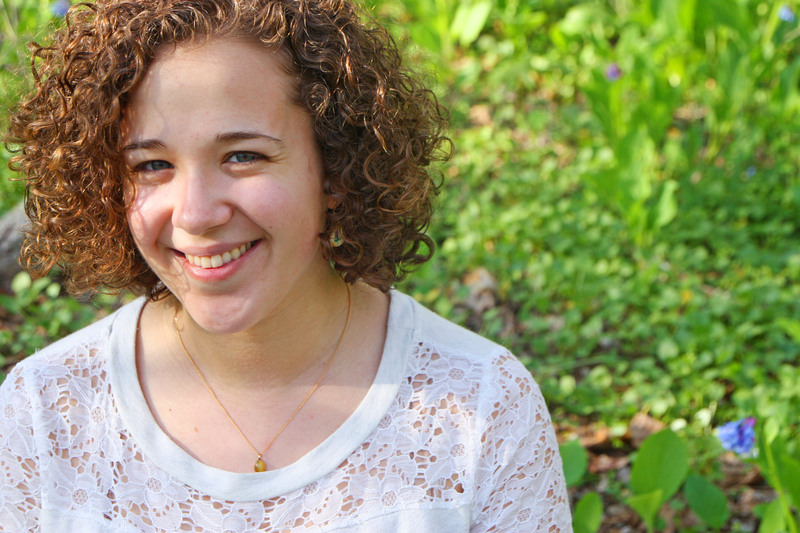 I’m a YA/MG writer who loves writing stories with dark secrets, untold histories, stubborn characters, and the occasional spark of real magic. I am currently working on two manuscripts: one, a YA novel, the other a novel for MG/young readers. My first book, Byberry State Hospital, (Arcadia Publishing, 2013) is a non-fiction pictorial history about the abandoned state mental hospital located in the outskirts of Philadelphia that I grew up near. I used to pass it every Saturday morning on my way to my roller skating lessons (thanks to which I can skate forwards, backwards, in circles, and with minimum injury or embarrassing falls). I used to ask my parents a million questions about the hospital and now I finally know the answers. My full name is Hannah Karena Jones. I grew up in the suburbs of Philadelphia in a pink and green house with a pink plaid kitchen ceiling and many other rainbow-worthy rooms. Every summer I was the water rat at the local swim club who would hold her breath underwater instead of obediently getting out during adult swim. When I wasn’t swimming, I was journaling in my neverending series of diaries (27 composition books and counting! ), checking out the maximum amount of books from the public library, reading under the covers like it was my job, and attending various sporty summer camps in a vain attempt to improve my non-existent athletic abilities. The school year was pretty much the same: Reading Olympics, swim team, marching band, chamber orchestra, writing bad poetry for the high school literary magazine. I moved to the only official town in Pennsylvania where I read a lot (about Joan of Arc), wrote a lot (about Joan of Arc), and slept little (thanks to Joan of Arc…noticing a theme here? ), ultimately graduating from Bloomsburg University with dual degrees in Creative Writing and History and a minor in Professional Writing. After that, I hung out with some of the best book nerds I’ve ever met at the New York University Summer Publishing Institute. I’m now what some people might refer to as a “grown up” with a “grown up job” (I’m managing editor at Running Press) and I live in New Jersey with several rainbow-worthy rooms. My roommates include a cat named Gizmo and a Welsh terrier named Cricket. Well thanks, freedomtights, and thanks for stopping by! Thanks vanderjohn, and thanks for exploring my blog! Sorry if I seem totally ignorant of the terminology: what do you mean by swap links? Just a quick note to tell you that I would like to pass “The Versatile Blogger Award” on to you! Hey! Thank you so much for nominating me, I’m flattered! I noticed that your post has gotten me quite a few blog hits, so thank you for that too! Hello Hannah. I stumbled across your blog via freshly pressed. 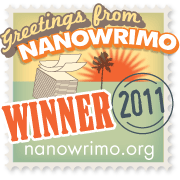 I am entering into NanoWriMo, 2011 will be my first attempt. Hope to see you at the finish line. Im a NYU alum, received my undergrad from there. Very cool, thanks for stopping by! Good luck to your NaNoWriMo attempt too! Did you do your undergrad in writing? Hi Hannah, thanks for stopping by and liking my post. It looks like you may have read the two new published stories too – excellent! I appreciate the readership and support. I’m absolutely thrilled to be published in PANK! Thank you for ‘liking’ my post “Do)n’t( Push”. I’m new to the writing industry. And as I have a full-time job, sometimes I feel like writing is my secret identity (Not nearly as cool as Batman, but still cool). I like the theme of your blog…waiting. I am currently waiting on reviews of my debut novel, “Solstice Night”. Great reviews would be…well, great, but right now I’m wondering if the reviewers are even bothering to look at my manuscript. Well you’ve obviously done something right with the terrific writing placements you’ve gotten already! Looking forward to sinking my teeth into the rest of your blog! Thanks Pete! Writer’s need lots of self-affirmation–and coffee…and chocolate–to stand against the tide of rejection and keep pursuing their writing goals! I’m excited to see you around the blog :] Good luck with your waiting! Oh, I’m so envious. I’m still in the can’t-get-it-into-an-envelope-because-I’m-too-frightened room! I’m going to like your blog (and probably you and all your cool writerly friends) and check in on you now and then. Maybe I can get to the waiting room, too! I hope the room you’re hanging out in is super productive and encouraging! The door’s always open to the waiting room :] It’s a big club. Hey, Hannah . . . thanks for checking out my blog. I look forward to visiting this place often and reading your take on writing! I’ve read just a few of your posts this evening, and they’re SO informative and well written. I will definitely be back!! It has been fun for me today and I have had quite an increase in my traffic. That is not why I accepted the nomination but it is a nice benefit! Thanks for the like on my short work! I feel flattered. I’m definitely going to follow you. Although my interests lie in higher academics, I’ve always got a pet creative piece that I want to get published, like every English major. Seems like you’d be a great go-to of information! Of course! Thanks for sharing your work :] We English majors are rather creative people. Hope you have a zoo of pet projects to keep you company :] And thanks–I hope to offer as much helpful information to other writers as possible! Hi Hannah, just wanted to pop by and say thanks for liking my post tonight. I hope you’re doing well. Also wanted to say the Thursday posts on “So You Want to Be In Publishing” are ENJOYABLE and INSIGHTFUL. Please keep up the great work on those! I nominated your blog for Versatile Blogger. Do with this what you will! Thank you visiting my blog back in May. I’m sorry it took me so long to make it to yours, which is very great! Best wishes with your book! Well it’s nice meeting you, however belatedly. Hey, thanks for liking my Working Routines post! I am glad I came across your blog. I especially enjoyed reading the “So you want to work in Publishing” posts. I am an English major who has been out of college for a while and am hoping to break into the publishing industry. I am thinking of attending a summer publishing program in either NY or Denver. Your blog has been very helpful. Thanks again! Thanks for liking my post, “I was wrong”. I’m flattered. I love your blog idea and will be stopping by frequently. It’s definitely more fun to wait with someone than all alone. You’re welcome! Thanks for posting it, enjoyed the read. And truth! Writing is rather lonely. And the non-writers in my life are less interested in my rather broken-record conversation topics about waiting…and writing…and query letters, lol. Better to find a different audience!